ALS continues to erode my strength but it will never extinguish my passion for the outdoors. I had a fantastic trip last month. My wife couldn’t join me on this adventure, so my aide Ivson and I left home (Rio de Janeiro, Brazil) Friday night, Nov 11; on Sat morning we made our connecting flight in Atlanta and met my hunting buddy Ron Wagner in Minneapolis, and the A-Team flew to Billings, Montana. The next day we drove 4 1/2 hours to Glasgow, in northeast MT’s prairie region, where we enjoyed the gracious hospitality of Andrew McKean (editor of Outdoor Life) and his wonderful family. My hands have become too weak to use my plier-handles-style trigger release, so I ordered a TM-100 mouth-activated trigger mechanism from BE-Adaptive and had it delivered to Andrew. Since this device’s switchbox is designed to mount on a gunstock, I asked Brian (the manufacturer) to extend the wires because we need at least 4 feet of maneuvering room when my point man aims the rifle for me. Powered by a 12V battery, the “sip-activated” mechanism trips the trigger when I inhale on a rubber tube. While Ron rigged the trigger mechanism and Trophy Shot scopecam on Andrew’s Savage .270, Ivson and I found a way to secure the switchbox’s Velcro straps to my neck brace so the rubber tube would stay in an easy-to-reach position. We had two tags for antlerless whitetail and I had a general deer license (good for one deer—mule or whitetail, buck or doe). Andrew said our best bet for whitetails was in a blind he’d set up on an alfalfa field 400 yards behind his house. Nobody argued when he explained that he hadn’t been seeing much deer activity early in the day and suggested hunting only in the afternoons. That would give Andrew time to get some work done in the a.m. and let us hunt during the heat of the day—morning temps were in the teens, afternoon highs in the mid 30s. 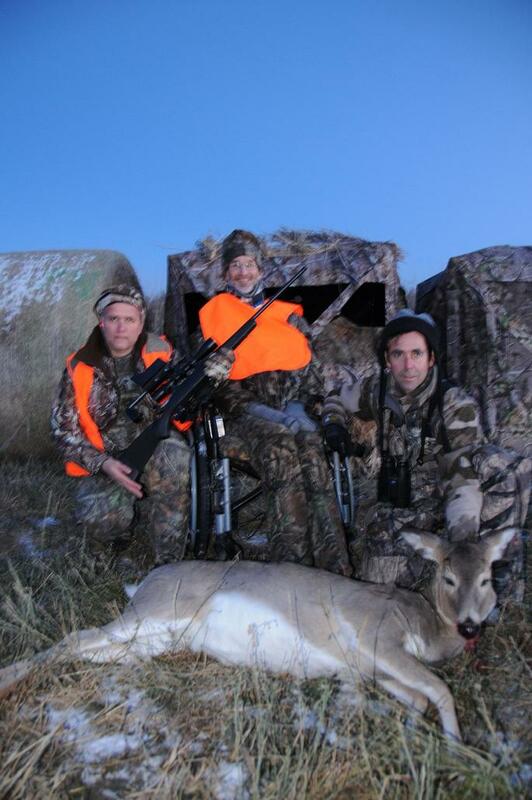 On Monday afternoon Ron, Ivson and I settled into the blind around 3 while Andrew and his friend Mark Copenhaver scouted another area for mule deer. While waiting for deer to appear, we saw something rise slightly above the foot-high alfalfa and swivel like a periscope—a pheasant head! Soon we noticed 30 birds in the field. Deer began filtering into the field shortly before sunset, about 20 does and yearlings, no bucks. We waited 25 minutes for one to offer us a broadside shot at 130 yards. Until now, our shooting sequence always went like this: Ron would flick off the safety, put the crosshairs on the target and say, “Whenever you’re ready.” Then I’d start squeezing my manual trigger release and the gun would fire after a 2- to 5-second delay—an agonizing eternity when you’re aiming at a live animal and trying to hold a rifle steady, even when supported by shooting sticks. My new trigger setup has greatly improved my reaction time. Back to the alfalfa field: Watching the scopecam monitor, I saw the crosshairs settle on the deer’s neck. Ron calmly said, “OK, Andy, whenever you—”BAM! Then he said he’ll never mount this device on a semi-automatic rifle for fear of what might happen if I got the hiccups. 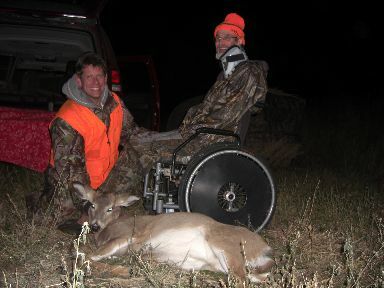 Montana issued me a disabled hunter permit, which allows me to shoot from a stationary vehicle. On Tues afternoon we drove the rental Suburban (don’t tell Avis) across the prairie in search of mule deer. Andrew parked us near a deer travel route; he, Mark and Ivson stood outside the truck with binoculars, rangefinders and cameras while Ron and I set up to shoot from the back seat. The plan came together perfectly. We saw about two dozen mule deer...but missed our buck when we shot a bit high at a range of 300 yards. That night Ivson the Chillin’ Brazilian experienced his first snowfall. On Thursday morning Ron, Andrew and Mark were trying to figure the best way for me to shoot pheasants. From the blind with a .22? With a shotgun and red-dot scope? I said I’d rather watch them hunt, so Ron and Andrew took the shotguns for a walk while Mark, Ivson and I followed them through the fields in the Suburban. With Andrew’s yellow lab, Willow, flushing and retrieving birds, the hunters bagged one ringneck each. That afternoon our stakeout for mule deer was spoiled when Andrew had to chase two trespassers/poachers off his property. We thought the hunt was over, but thanks to persistence and some luck, the team helped me take a doe at the last possible minute of shooting light. We drove back to Billings on Friday, and on Saturday caught our flight to Minneapolis. Ron headed home from there while Ivson and I flew to Atlanta...after a 3-hour weather delay. We missed our connection to Savannah and spent a short night (4 hrs sleep) in an Atlanta hotel. My good friend Dean Hunter met us in Savannah on Sunday morning. We went to his house for lunch and a visit, then he drove us to Paradise Valley Hunting Club in Ehrhardt, SC. I went to bed at 9 and slept till 11 Monday morning! Bang Collins, owner of the lodge, was in the terminal stages of pancreatic cancer. I spent 90 minutes with Bang on Monday. Although heavily medicated, he recognized me, asked about Ligia and Ron, and cracked a few jokes. On Tuesday we sighted in my .17 and put my adaptive shooting gear on Bang’s custom .25-284. Rick Hires sat in as point man on Wednesday but we saw no deer. 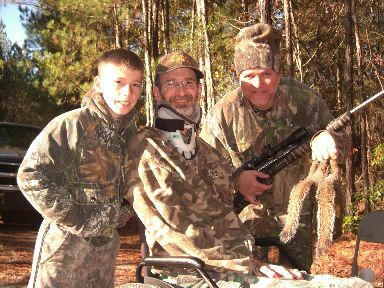 On Thanksgiving morning, 12-yr-old Klay Elixson joined us for a squirrel hunt and displayed a level of sportsmanship far beyond his age. Although his trigger finger was itching, he let Ivson—who was actually hunting for the very first time—do most of the shooting. I enjoyed spending time with Klay that morning and watching Ivson become a hunter. Klay jokingly asked if I thought Ivson was A-Team material, but the Brazilian proved himself worthy by picking off two bushytails at 65 yards with a .22 mag. In the afternoon Ivson and I spent two hours at the lodge’s rifle range with my .17, working on our team-shooting skills. I coached him on how to hold the rifle steady on the sticks while watching the scopecam monitor; as he gained experience, our shots got closer and closer to the bullseye. The practice gave Ivson confidence to assume point-man duties...but how would he do on live game? Rick put us in a pop-up blind on the edge of a tobacco field and said he’d return to pick us up after dark. We saw nothing for the first two hours, then, about 10 minutes after sunset, two does stepped out of the woods on the right, 70 yards in front of us. The doe stood broadside, looking in our direction. “Perfect,” I thought, until the crosshairs settled low and too far back. It was fairly dark by now, making the image in the scopecam barely discernible, and Ivson didn’t have a full view of the monitor because he held the gun slightly to one side. I realized I’d have to tell him where to aim. Thus began the comedy act: ALS has slurred my speech; I can’t push enough air to whisper, so I’m trying to murmur softly while my heart races and breathing runs fast and shallow; I’m speaking Portuguese, so instead of grunting monosyllabic directives (left, right, up, down), I have to enunciate esquerda, direita, cima, baixo. Oh yeah, and my tongue keeps tripping on that trigger tube flopping around between my lips. When the crosshairs finally hovered over the sweet spot behind the front leg, I sipped, the rifle boomed and the deer disappeared in a flash. The muzzle flash, that is, which blinded us momentarily and kept us from seeing if we’d connected. Rick appeared seconds later; he’d observed the episode while hiding 40 yards behind the blind. “I think you missed,” he said. My heart sank...until we learned he’d been watching the deer on the left. 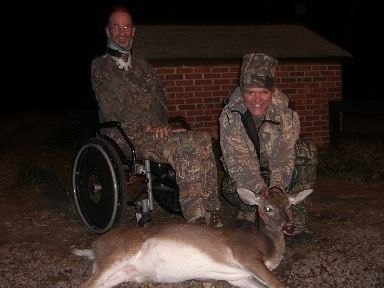 Within minutes Rick found signs of a hit and followed the blood trail to our doe, piled up 80 yards inside the woods. We made a perfect double-lung shot. I told ya Ivson was A-Team material! We saw another doe Sunday evening but it didn’t stick around long enough to give us a shot. Our visit to SC ended on a sad note. Bang passed away in the early hours of Monday, Nov 28. We’ll miss our friend and mentor.